When you select a statement a submit button will appear. Clicking on the submit button, adds your results to those of others and provides you with a three page survey report, including a graphical representation of the results to-date. I get little from being part of my organisation and my work is not valued. I get little from being part of my organisation yet my work is highly valued. I get a lot from being part of my organisation but my work is under valued. I get a lot from being part of my organisation and my work is highly valued. Contact us if you would like to conduct this free survey within your own organization. The survey can be set up so results are broken down to the individual team level. 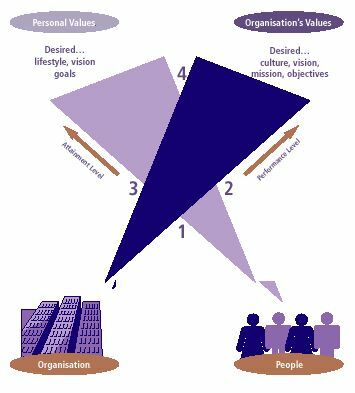 It is an ideal way to determine 'hot-spots" in your organization that would most benefit from a workplace-values program.